"Our meeting did not last long," House Speaker Nancy Pelosi, D-Calif., told reporters, standing in the chilly White House driveway. "It's cold out here, and the temperature wasn't much warmer in the Situation Room." "Unfortunately, the president just got up and walked out," said Senate Minority Leader Chuck Schumer, D-N.Y., after Pelosi said the Democrats are unwilling to agree to wall funding. 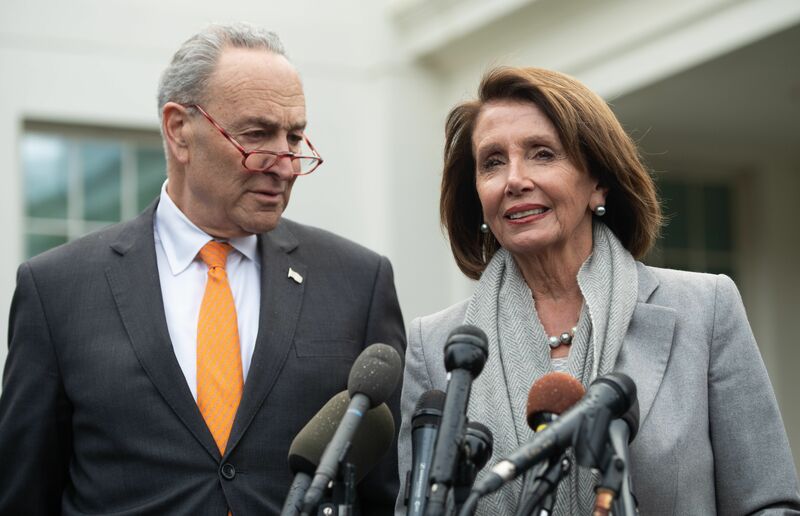 Senate Minority Leader Chuck Schumer and House Speaker Nancy Pelosi speak to the media following a meeting with President Trump about the partial government shutdown at the White House on Wednesday. Vice President Pence blamed Democrats for refusing to give ground on the wall. "In this brief meeting, we heard once again that Democratic leaders are unwilling to even negotiate to resolve this partial government shutdown or address the crisis at our Southern border," Pence said. "What the president made clear today is he is going to stand firm to achieve his priorities: to build a wall, a steel barrier on the Southern border." With the two sides at an impasse, some 800,000 federal employees are expected to miss their first paycheck, on Friday, since the shutdown began on Dec. 22. "The president seems to be insensitive to that," Pelosi said. "He thinks maybe they could just ask their father for more money. But they can't." Earlier, Trump met with GOP senators, urging his fellow Republicans not to waver in their demand for a border wall. "The Republicans are totally unified," Trump told reporters after that meeting. "There was no discussion about anything other than solidarity." The president insisted that a compromise is still possible, but he also threatened to use emergency powers if necessary to fund the wall. "I don't think we'll have to do that, but you never know," Trump told reporters. "I really believe the Democrats and the Republicans are working together." There was little evidence of that during the White House meeting or on Capitol Hill, where lawmakers from both parties traded barbs and blamed the shutdown on the other side's inflexibility. Trump's prime-time address from the Oval Office on Tuesday appeared to have done little to change the terms of the debate. Schumer dismissed the president's speech as "little more than a rehash of spurious arguments and misleading statistics that the president has been using for weeks." "In no way did the president's speech last night make a persuasive or even a new case for an exorbitantly expensive border wall," Schumer said, noting that he is talking about "a wall that the president guaranteed would be paid by Mexico." Democrats accused the president of using the shutdown to gain political leverage, while forcing Transportation Security Administration officers, food safety inspectors and Border Patrol agents to work without pay. A handful of GOP senators have broken with their party and voiced concern about the shutdown. "I don't like government shutdowns," said Sen. Lisa Murkowski, R-Alaska. "I don't think they're a good way to govern, and we ought to be able to get our work done." But Senate Majority Leader Mitch McConnell, R-Ky., has not budged. McConnell described the president's wall proposal as "imminently reasonable," and noted that Democrats have supported similar border barriers in the past. "Steel fencing was fine, even salutary, when President Obama was in the White House," McConnell complained. "But it's 'immoral' when President Trump occupies the office." "Do Democrats want to hold everything hostage?" McConnell asked. "I urge my Democratic colleagues more strongly to get past this purely partisan spite." Congressional Democrats are equally dug in. "Democrats have consistently indicated that we are willing to substantially increase funding for border security," said House Democratic Caucus Chairman Hakeem Jeffries, D-N.Y. "But we are not willing to waste taxpayer dollars on a medieval border wall that is a fifth century solution to a 21st century problem. And we are certainly not willing to reward a presidential temper tantrum that has shut down the government for 19 days." Rep. Pramila Jayapal, D-Wash., added, "I just think this is a situation where (Trump) is holding the American people hostage to a vanity wall fantasy. He should let that go. It's absolutely false that the border wall is the way to deal with any humanitarian crisis or national security." Trump described the federal employees who have been furloughed or are working without pay as "terrific patriots" and has insisted without evidence that both government workers and the general public support his effort to secure funding for the wall. "The people out there want something to happen at our Southern border," Trump said. "It's a very bad political issue for the Democrats. That I can tell you." A Reuters/Ipsos poll published Tuesday found only about 4 in 10 Americans support the idea of building additional barriers along the border, and support has fallen since 2015. 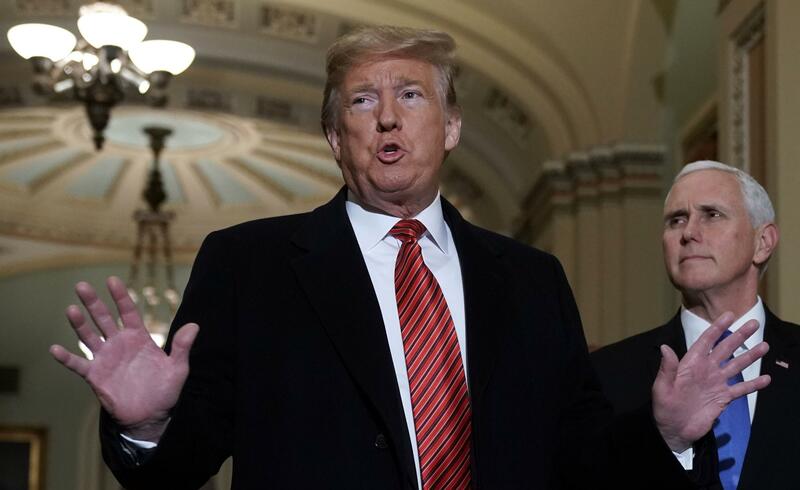 The same poll found 51 percent of Americans say the president "deserves most of the blame" for the government shutdown — an increase of 4 percentage points since a poll taken just before Christmas. Among Republicans, however, support for the wall is much stronger, with 77 percent approving and 54 percent supporting the shutdown as a means to that end. Bye-bye. That, according to a tweet from President Trump, is how a meeting between the president and Democratic congressional leaders ended late this afternoon. It was yet another meeting to try and find a solution to the partial government shutdown over a wall at the southern border, now in Day 19. Senate Minority Leader Chuck Schumer added some detail to what happened at the contentious meeting as he and Democrats were leaving the White House. CHUCK SCHUMER: Well, unfortunately, the president just got up and walked out. He asked Speaker Pelosi, will you agree to my wall? She said, no. And he just got up and said, then we have nothing to discuss. And he just walked out. CORNISH: NPR's Kelsey Snell has been following these developments. She joins me now. Hey there, Kelsey. CORNISH: So this was supposed to be a chance to make progress - right? - on ending the shutdown. Where does it leave things? SNELL: Well, basically nowhere. This is actually worse than where we were yesterday when they were pretty much dug in on both sides. The meeting lasted about half an hour, which is far less than the last several meetings that they have had. And Republicans at the meeting kind of disputed Schumer's characterization there. Schumer said that the president slammed his hands on the table and walked out. The vice president says he doesn't recall that happening - the slamming or the raised voices. And they said Trump brought everyone candy. But at the end of the day, he did walk out, and they are not negotiating anymore. CORNISH: This wasn't the only meeting today in Washington, right? I mean, is there a path forward? SNELL: Well, it's really hard to see how they resolve it. It's - it - this is - this kind of new frustration is a departure from where things were at that meeting. Trump sat down with Senate Republicans. And during that lunch, he talked a lot about unity. And when I talked to Republicans leaving the meeting, they said they thought the only way for this to end is for both sides to compromise in some way. And I thought it was really interesting that Kentucky Senator Rand Paul, who's really not somebody we usually know for his willingness to compromise, was pretty clear about what he wanted. RAND PAUL: I like the middle ground, frankly, splitting the difference. I think 2 1/2 billion, and the government opens back up. And he doesn't get everything he wants, and the Democrats don't get everything they want. I mean, really, I think it's an untenable - both are untenable positions. SNELL: Right. So he's saying $2 1/2 billion for border security and the wall, which is down from President Trump's ask of $5.7 billion. But that is not at all what Republicans were talking about after that White House meeting. So it sounds like we're back to square one. CORNISH: Does it mean that there is a greater chance that the president could still decide to declare a national emergency to build the wall? SNELL: Well, that came up at the lunch between the president and Republicans. And senators, including Tim Scott of South Carolina, said that Trump indicated that he isn't interested in going down that route at this time. And Trump himself had softened his position on it when he talked to reporters today. But he said that if Democrats won't deal, that the national emergency is an option. And I think that there is a really strong chance that he could return to that now that this meeting fell apart. CORNISH: How is Congress responding to that idea? SNELL: Well, some notable Republicans, like Mac Thornberry, who is the top Republican on the House Armed Services Committee, said that they don't support it. There are other Republicans who say it could turn into a legal challenge - that this could drag on, and the wall could never be built if, you know, the president goes down the route of a national emergency that Congress doesn't approve of. And mostly until now, they've been able to avoid the question as a hypothetical. But as things go forward, and as this digs in further, it gets really hard for them to avoid the question - right? - because people are asking the president about it, and the president keeps addressing it himself. CORNISH: Is there anything that could bring people back to the table? SNELL: Well, there are a couple of things that are still floating around, and one of those is that, you know, there are 800,000 employees out there - federal employees who either aren't working or are working without a paycheck. And this coming Friday is the first time that that paycheck won't get paid. And, you know, one person who kind of explained it is Alaska Senator Lisa Murkowski, who said she's really, really worried that this Friday is the exact moment when things get tough. LISA MURKOWSKI: I was certainly one who has expressed clearly that I don't like government shutdowns. I don't think that they are a good way to govern. SNELL: And that - that's her kind of softening, right? She's saying that, you know, she wants to get out of this somehow. And later, she told us that she raised the issue with President Trump, and she said he listened and urged unity on the entire strategy, but he really didn't say much more than that. So it's unclear what will really get people moving.